Functions include can/bottle opener, cork screw, reamer, manicure blade, sturdy reamer, Phillips screwdriver, hook disgorger, fish scaler, wood/rope saw, scissors, cutting blade, cap lifter, slot screwdriver and key ring. Pocketknife is made of indestructible stainless steel for a lifetime of hard work and constant use. This is a triumphant combination putting the 11-in-1 master tool and �Falcon II� lockback pocket knife into one compact unit. Both fit in a special double pouch. This heavy duty Kelvlon� pouch can be attached to a belt horizontally or vertically for comfort and convenience. The 11-in-1 tool includes pliers, wire cutter, bottle opener, file, Phillips screwdriver, 3 slotted screwdrivers, large cutting blade, small cutting blade doubling as an awl/punch and can opener. It easily opens with either hand. Lockback for safety. Camouflage is the name of the game for this Maxam� Liner Lock Pocket Knife. Easy one hand thumb button opening, cutouts in the handle to lighten the weight without sacrificing strength and durability and comes with clip. The Honed Lockback Pocket Knife with bead blasted finish on the blade and stainless handle. 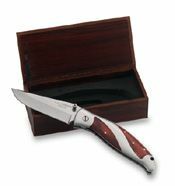 Features exotic wood scales, stainless clip and thumb stud and liner lock for one hand use. All Stainless Lockback Pocket Knife with half serrated blade and pocket clip. Thumb studs on either side of the blade means the knife can be opened with either hand. This pocketknife features one hand opening with half serrated blade and clip. 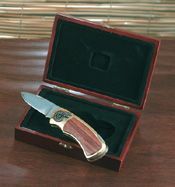 Features one handed opening and closing with a heat treated stainless steel clip. This handy utility knife , the right tool for serious cutting , will become a permanent fixture in your pocket. Do you like to go camping? The Maxam "Survival Buddy" will make camping a whole lot easier. The "Survival Buddy" is a 17 Function multi-blade knife that will make camping a walk in the park. 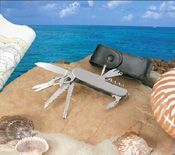 Functions include: 2-1/2" blade, wood/rope saw, fish scaler, hook disgorger, ruler, scissors, can opener, cork screw, phillips screwdriver, reamer, nail file, bottle opener, small screwdriver, line guide, awl punch, nail cleaner and key ring. Functions include can opener, cork screw, reamer, manicure blade, sturdy reamer, Phillips screwdriver, hook disgorger, fish scaler, wood/rope saw, scissors, cutting blade, cap lifter, slot screwdriver and key ring. Pocketknife is made of indestructible stainless steel for a lifetime of hard work and constant use. Comes with its own sheath designed to slide on to your belt. Engravable. This pocket knife features 420 surgical stainless Japan steel blade that is 1/8" thick, nearly twice as thick as many ordinary pocket knives, which provides for a more secure lock. The Rock is perfect for skinning an animal and sturdy enough for the daily use of an electrician or carpenter. Comes with a heavy duty Kelvlon� pouch. This handy knife on a key chain features an extra sharp 1-7/8" blade to cut cord or twine easier and lightweight Leymar� handle. The thumbhole allows one-handed opening with either the left or right hand. Oval hole in the blade makes for safe and easy opening. The metal clip fastens easily to your belt loop. Features thumb stud and liner lock for one hand operation. Makes an excellent gift for the avid knife collector.